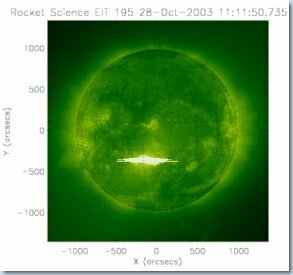 During solar flares energetic nonthermal electromagnetic radiation up to the gamma-ray range is emitted from the solar atmosphere, implying the generation of accelerated electrons and ions. Particle acceleration in cosmic plasma is of fundamental physical interest. The solar corona offers detailed remote sounding of these processes. An interesting example is the X17-flare of 28 October 2003, one of the strongest events of the last activity cycle. Figure 1 shows the Sun as seen by SOHO EIT about 10 minutes after the onset of the impulsive flare phase, still overexposed at the active region 10486. The closer field of view TRACE image below it is taken in the same spectral range, and the isolines overplotted are the hard X-ray sources imaged by the RHESSI spacecraft. Figure 1: The sun at 195 Å, with the flaring active region NOAA 10486 at about 11:12 UT. At the top: SOHO EIT image. At the bottom: TRACE image with superposed RHESSI hard X-ray sources (red contours: 12-25 keV, blue contours: ≥ 100-300 keV). For this event an enhanced flux of hard X- and gamma-rays up to an energy of 10 MeV had been observed by the INTEGRAL spacecraft (flux curve on top of the right panel in Figure 2) indicating strong impulsive generation of relativistic electrons. The radio signature of a standing shock wave occured in the AIP radio data simultaneously with the enhanced energetic radiation (bright backbone and herringbone fine structure emission in the dynamic spectrum, bottom of the right panel in Figure 2). In the framework of the magnetic reconnection scenario of eruptive flares (Figure 2, left panel), jets appear in the outflow region (bounded by slow mode shocks, SMSS) above and underneath the diffusion region (DR). If the jets penetrate with a super-Alfvenic speed into the surrounding plasma, then standing fast-mode shocks (FMSS) can be established near the postflare loop top (PFL), and – less probably – behind the erupting prominence (EP). We call these shocks “outflow termination shocks”. They are a source of energetic electrons and become visible in meter wave radio emission under certain conditions (as was recognized for the first time in AIP dynamic radio spectra, see previous work in A&A 2002, 384, 273 and ApJ 2004, 615, 526). 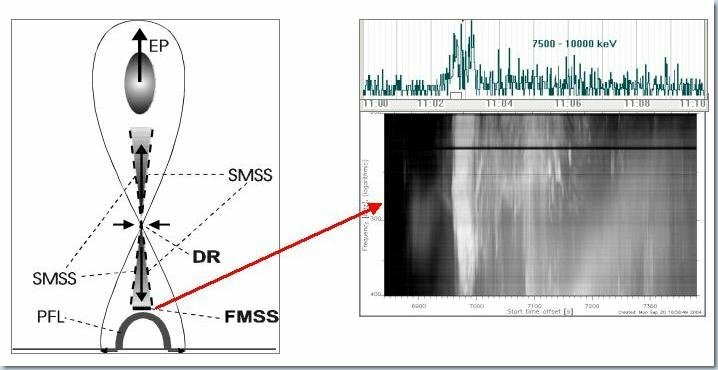 We quantitatively checked the question how powerful an electron accelerator can contribute to the observed flare energy release given the termination shock (in Figure 2, left panel, abbreviated as FMSS – fast mode standing shock) magnetic field configuration. In contrast with earlier work, the theoretical considerations are founded on realistic coronal parameters well observed for the huge X17-flare of 28 October 2003 (see the comprehensive data analysis by Aurass, Mann, Rausche & Warmuth, in A&A 2006, 457, 681-692). Figure 2: Scheme of the plasma-magnetic field configuration evolving in the corona during an eruptive flare. The red arrow points from the fast mode shock (FMSS, also known as the termination shock) in the scheme to the radio signature of this shock in the AIP dynamic spectrum. Top panel on the right: 7.5-10 MeV flux measured by INTEGRAL (after Gros et al. 2004, ESA-SP 552, p. 669). Bottom panel on the right: AIP dynamic radio spectrum , range 200-400 MHz, same time scale, on 28 October 2003. As shown in the diagram in Figure 3, the electrons are energized by shock drift acceleration which was necessarily treated here in a fully relativistic manner. After acceleration, the electrons travel along the postflare loop magnetic field towards the denser chromosphere where they emit hard X- and gamma-ray radiation via bremsstrahlung. Using the derived theoretical results, the observed photon fluxes in the range 7.5-10 MeV are well explained. Our work confirms the prediction by Tsuneta and Naito (ApJ 1998, 495, L67) in a quantitative manner. The presented results are a serious step toward a better understanding of energy release in solar flares. 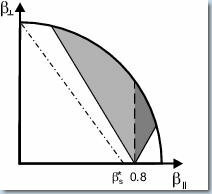 Figure 3: Illustration of the effect of shock drift acceleration in the velocity space. For a shock wave with a normalized speed of 0.8 and a magnetic field strength jump of 2, all particles in the grey area are transformed into the dark area. In the same case, all particles right of the dash-dotted line will be transmitted into the downstream region at the second shock encounter.